Apple is gearing up to announce the most radical of iPad redesigns it has done since, well, ever. It went all out with design upgrades this year, ditching its signature home button once and for all on all of its iOS devices so far, and the new iPads won't be exceptions, it seems. The new iPad Pro 12.9" and 10.5" models will also ditch the key for a TrueDepth camera kit embedded in the shrunk bezels, just like all three new iPhones feature Face ID for unlocking them. 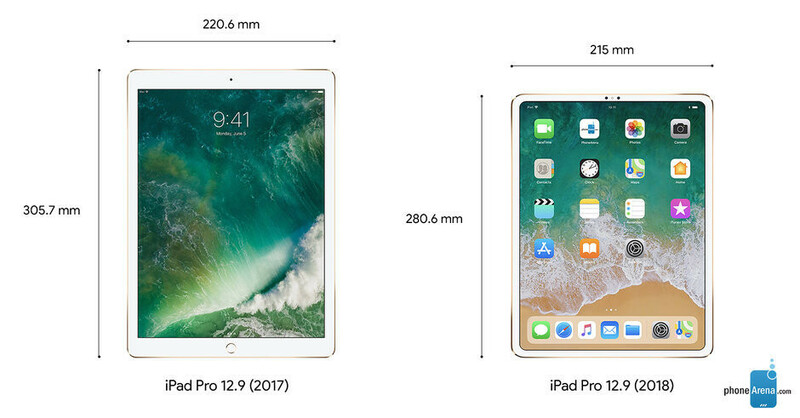 Thanks to some leaked schematics we made new iPad 2018 renders which show that the curved sides of the current crop will be replaced with more edgy ones, and the bezels will shrink drastically shrunk all around, placed symmetrically between the screen and the edges. The display has rounded corners like on the notch-y iPhones, but a notch is nowhere to be seen, thankfully, and, overall, the new iPad Pro looks slabb-y and with a kind of industrial elegance over the current edition. The only thing that remains a mystery, however, is a doohickey that looks like docking pins of sorts, near the charging port. The premise so far is that this is the Smart Connector moved there for added functionality when the iPad is docked in portrait mode, but we'll see what Apple has really meant very soon. There is also a mysterious elliptical button-looking or tray thingy on the right where the volume keys are, whose purpose is yet to be guessed or revealed. Throw in the four corner speakers and herald the return of antenna lines at both ends, and this is probably the most exciting update to the iPad line in a while. Here comes the pressing question - how much will Apple charge for the new design, and, most likely, upgraded internals? After all, if history is any indication, we expect an Apple A12X Bionic chipset to land inside, and the whole "real Photoshop on the iPad" premise won't come cheap, either. The current cream of the iPad crop, the 12.9" Pro version can go all the way up to $1279, but that is for the most souped-up, 512GB version with cellular connectivity. The smaller, 10.5" Pro model, starts at just $649, on the other hand, for the basic 64GB model with Wi-fi only. Apple raised the prices for everything with its TrueDepth camera module, and the new iPad Pro 2018 models likely won't be an exception, especially if basic storage is also raised. Thus, we expect the price tags of the iPads about to be unveiled on October 30 to be as follows. The last iPad Pro models were announced Monday, June 5th, and started shipping on the same week, Friday, June 9th. If Apple follows in the same vein, the new iPad Pro 2018 models should be released on Friday, November 2, a few days after they get announced at the October 30 event and a week after the iPhone XR release. Thus, Apple will have a full suite of new iOS gear equipped with the Face ID camera kit as stocking stuffers for the all-important holiday shopping, and it seems determined to shatter its sales and revenue records. Android has been both lame in designing and their OS. This statement doesn’t even make sense. Android doesn’t design phones/tablets. Google and many companies do. In terms of os it’s pretty obvious who’s ahead in features. TRUE to a point.... Better Design, and same Lame but EXTREMELY effective OS. As an Android guy (mainly) I Love my iPad, it gets things done in an efficient manner with none of the slow down for that is typically associated with PCs (which I use). I can do some light Video editing Picture editing Web Searches Actually takes decent photos in a pinch Great for Presenting Again, it is plain and lame, but it is Especially effective in meeting the needs of 90% of people. Seems like a bargain compared to a XS Max 512GB.